I’m a huge fan of the baked chicken with rice and beans at Salt & Pepper (on 33rd btw. 6+7th), so Sophie’s was going to have to be on their a-game to win me over. This baked chicken with rice and beans wasn’t great but it was decent. The skin on the chicken had some great flavors though sadly the great flavors on the skin stayed on the skin. The meat was juicy and tender but sort of bland. Even the rice was lacking flavors. But the pieces of yuca and carrots (they were sitting in the chicken juice tray along with the chicken) that came with the dish were fantastic. It fact they had soaked up so much chicken juice sitting at the bottom of the tray, they had more chicken taste than the chicken itself. The server did scoop some chicken juice into the platter but maybe next time I’ll ask for more. Or I should just get a jar of their green sauce to go. 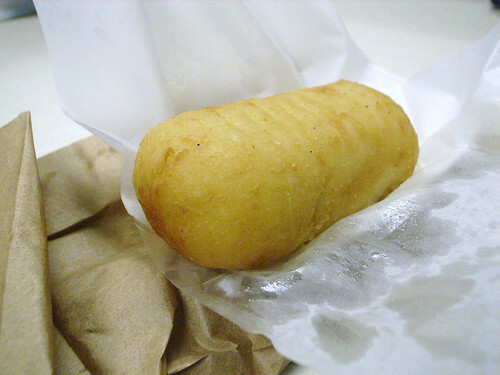 Thankfully the meal was saved by the cassava with pork (which is basically a croquette stuffed with ground pork). Even sitting out for who knows how long, it was still nice and crispy on the outside. This is what good fried food should be like, crispy, not too greasy, and damn satisfying. Posted by Donny T. at 11:30 am, September 22nd, 2011 under Sophies. Sophie’s baked chicken isn’t so wonderful, but their “spicy grilled chicken”, marinated flattened chicken breast seared on a plancha and served with barely-sauteed white onions and jalapenos, is awesome. If you’re willing to go a bit less healthy, their “breaded chicken” is excellent also. It’s basically a heavily spiced chicken schnitzel, and they serve it with awesome pickled onions. And of course every sophie’s meal must be doused with their green sauce. 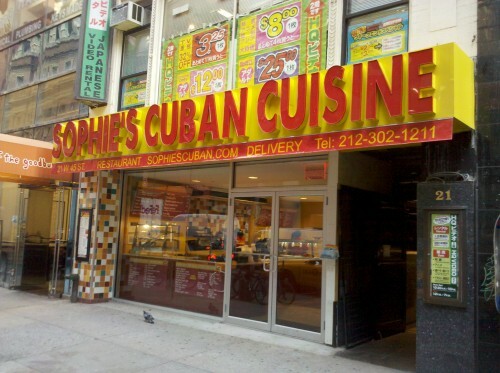 There is also a Sophie’s on W. 45 St. between 5th and 6th. You made a big error by not getting the pork. It’s my favorite item there. One day I even saw turkey (el pavo) there! Didn’t try it, but was wondering if anyone else here tried it. Finally, check out Spohie’s combos — they are an excellent value at $8.99 plus tax. You get a sandwich, platter of rice and beans (alone the rice and beans are $4.99 plus tax), and soda for that low price. I can eat it for lunch AND dinner. It’s the main reason I go to Sophie’s and not Margon. The only criticism I have is that they can certainly keep some of their food much hotter before serving. I have often needed to microwave it once I returned from the short walk back to my office. I’m not a big fan of getting baked chicken when I go out to eat, especially knowing how prone it is to being as dry as sandpaper half of the time. Latin baked chicken is usually not dry. If it’s marinated in a mojo, it’s really going to be tender. 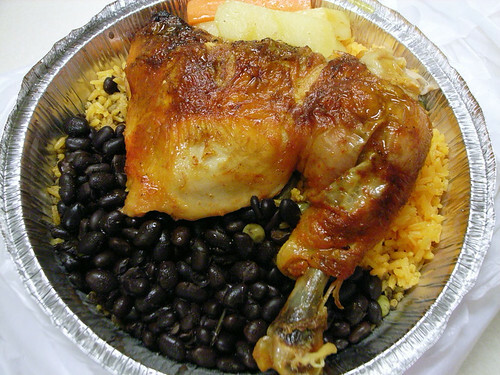 If you’re ever in Vinegar Hill at lunch time, try the baked chicken at Los Papis on Bridge Street. Really great Dominican food and the chicken isn’t dry at all. Sophie’s finally reopened on 3rd Ave and I dropped in to try the baked chicken. It was good, but not great. It just wasn’t as tender as some of the great chicken places I’ve been to on LI like Super Pollo and Pollo el Paisa. The rice and beans were OK too. I think I’ll stick to their pernil. It’s good and very easy to dip in the green sauce.